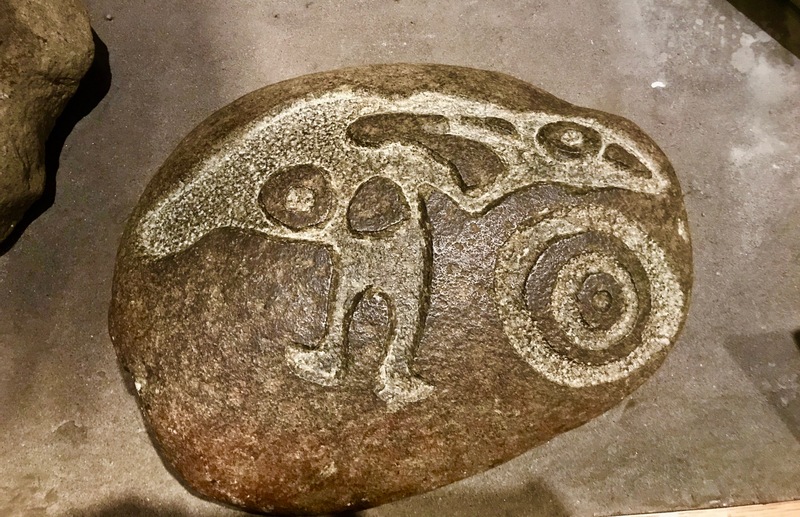 The smaller of the two skulls came from a gray whale. Gray whales typically show up in Alaskan waters during April. May and June are the best months for sightings. After that, these whales make their way up to summer in the cool waters of the Bering & Chukchi Seas. Their migration in the Pacific Ocean can be as much as 7000 miles one way. They start their journey south again in mid-October, reaching Baja California in December and January. Male gray whales reach 45 feet in length on average, with females growing a bit larger. Weight runs between 30-40 tons for both sexes. Unlike humpbacks, they have no dorsal fin. Lifespan is estimated to be 50-60 years. Of the three original populations of gray whales, the eastern Pacific stock that spends part of the year in Alaska waters, is the largest. The northern Atlantic population is extinct, and the Korean, or western Pacific population is now severely depleted. The larger of the two skulls is from a bowhead whale. The bowhead is Alaska’s official state marine mammal. Unlike the gray whale and humpbacks, bowheads spend their entire year in arctic and sub-arctic waters. 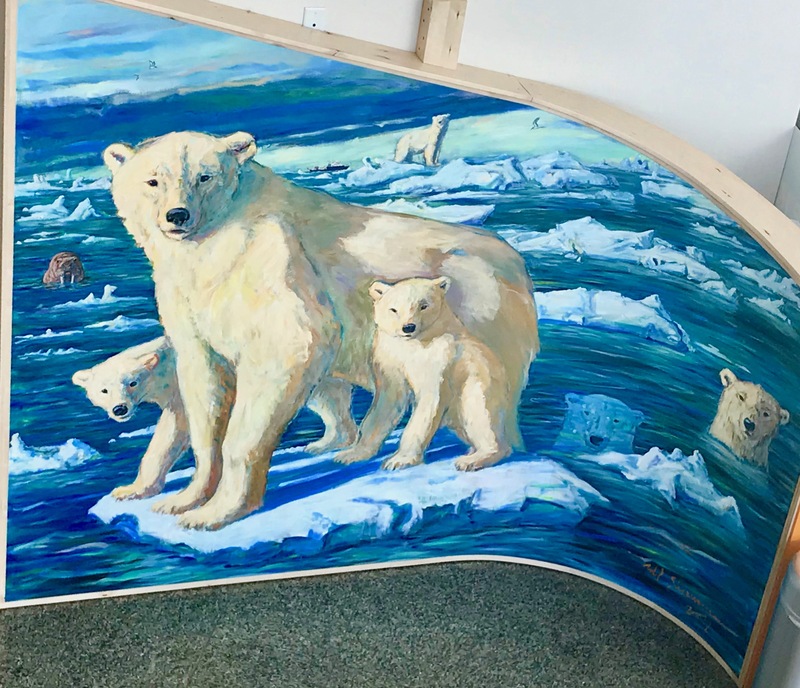 Their great arching head can break through sea ice to create breathing holes, and their blubber can reach 20 inches thick, accounting for half their weight. Bowheads are extremely vocal mammals, which in addition to communication, seems to aid in navigating the ice filled waters of the Arctic. 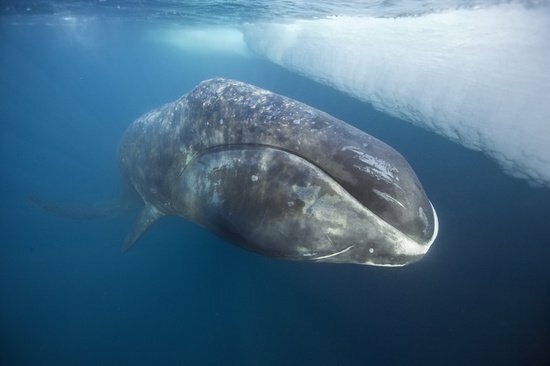 The bowhead may have the longest lifespan of any mammal on the planet at an estimated 200 years. 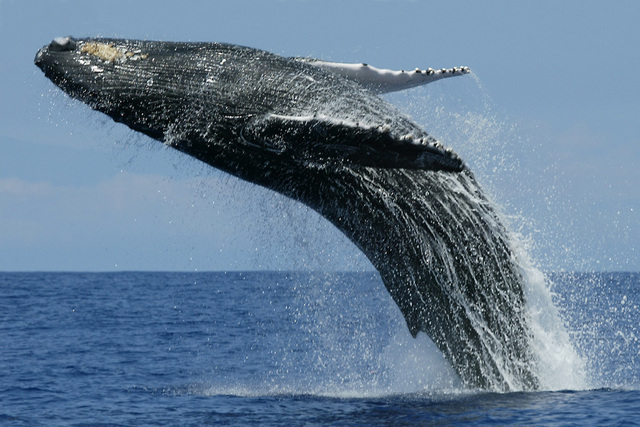 Bowheads run 45-59 feet in length, and weigh 75-100 tonnes as adults. Their population is still listed as threatened, with a world-wide population of 8000-10000. The Alaska population is doing the best, with the population tripling in the past 30 years. 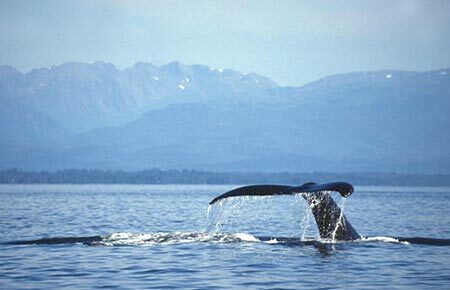 In all, Alaska has at least 14 species of whales that spend some, if not all of the year in its waters. 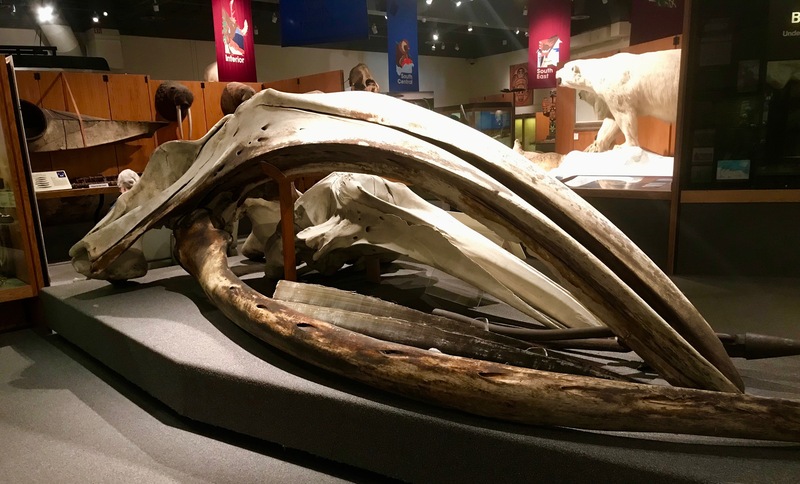 The museum expects to put a full humpback skeleton on display soon. 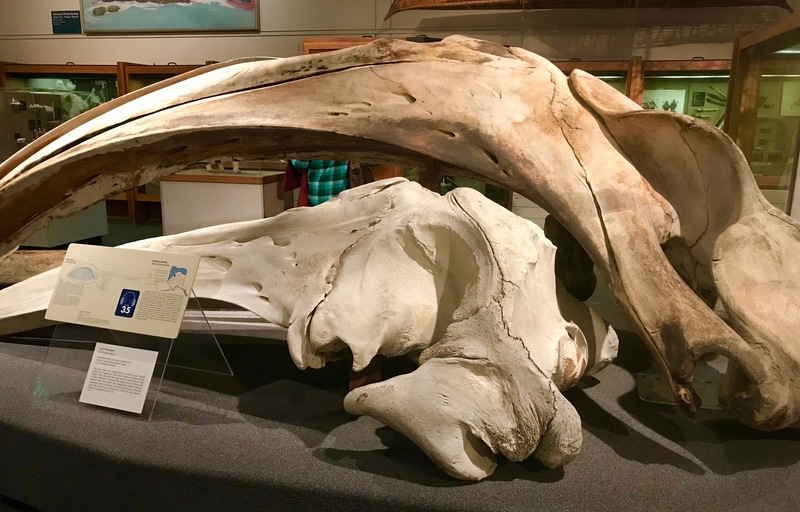 This particular humpback whale washed ashore near Anchorage, where a team from the museum collected the skeleton, then transported it over land to Fairbanks. The skull alone, weighed 807 pounds. Alaska once had dinosaurs. 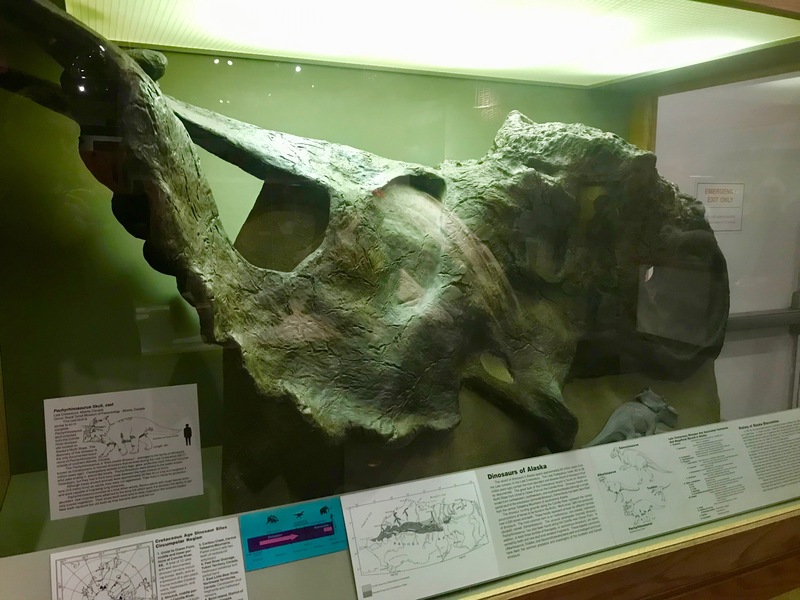 A pachyrhinosaurus skull like this one, was found along the Colville River on Alaska’s North Slope. The pachyrhinosaurus roamed northwestern North America between 71 million and 67 million years ago. Distantly related to the triceratops, the pachyrhinosaurus was a large, if unaggressive beast. Reaching 20 feet in length and around 4 tons in weight. They lived in herds, were herbivores, and seemed to migrate long distances. In Greek, pachyrhinosaurus means “reptile with a thick nose”. Like the triceratops, the pachyrhinosaurus had a thick, boney neck frill. 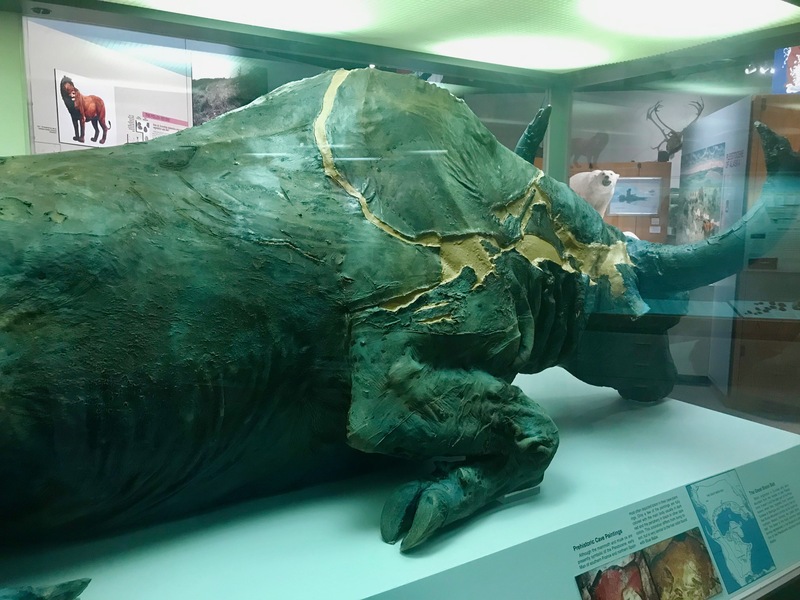 Unlike the triceratops, the pachyrhinosaurus did not grow horns, but had a large knobby growth protrude from it’s nose. Thanks to the Encyclopaedia Britannica for the pachyrhinosaurus rendering; and the Alaska Department of Fish & Game for the whale photos. And a special thanks to Ancient Greece for the name pachyrhinosaurus, which in a perverse way, I enjoyed typing over and over, because the word seemed to freak out my computer. 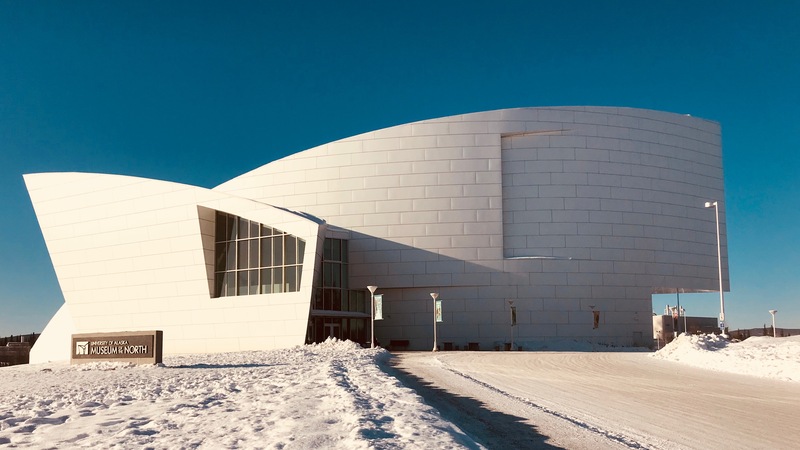 Located on the West Ridge of the University of Alaska campus in Fairbanks, is the Museum of the North. 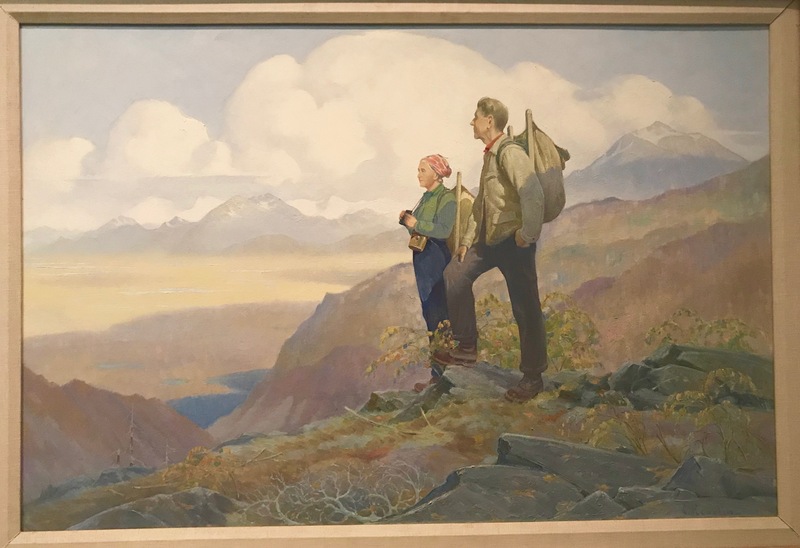 The museum takes on the daunting task of introducing visitors to the vastness and diversity, that is Alaska. 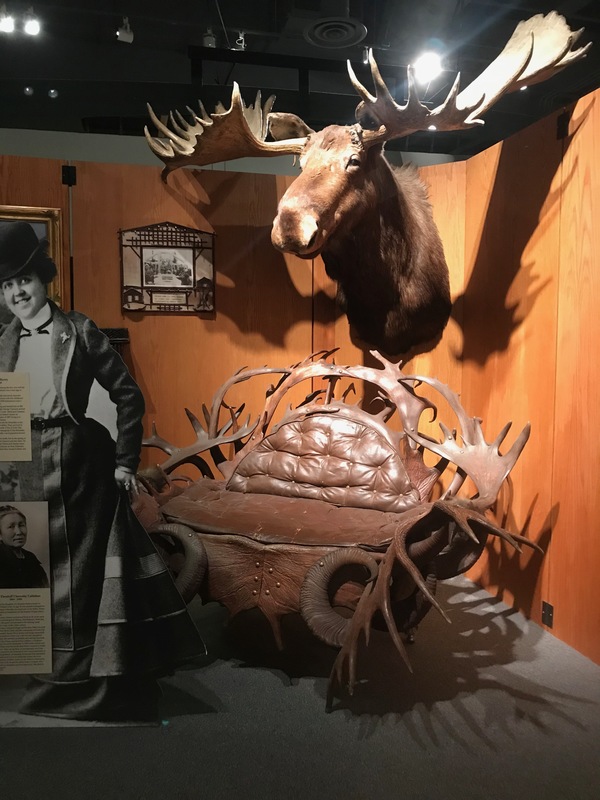 “Otto” has been greeting visitors to the museum since its inception. 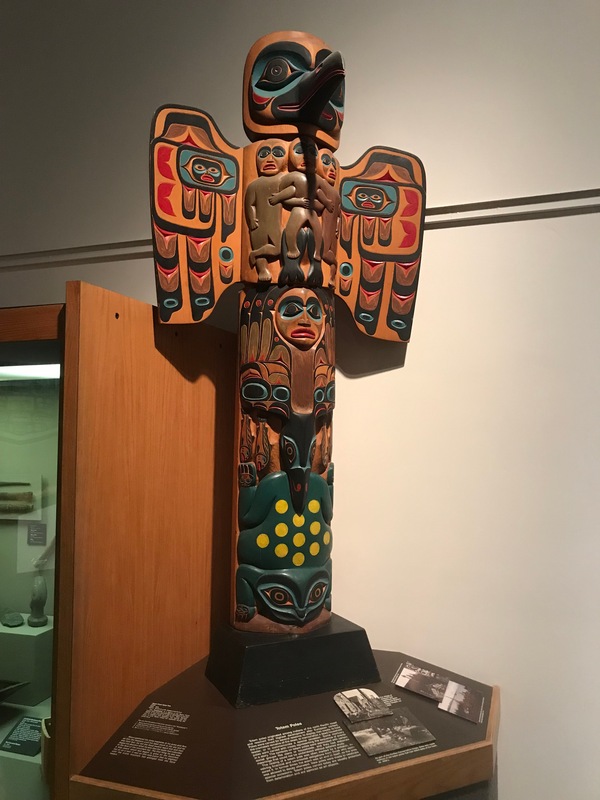 He stands, all 8’9″ of him, at the opening of the Gallery of Alaska. 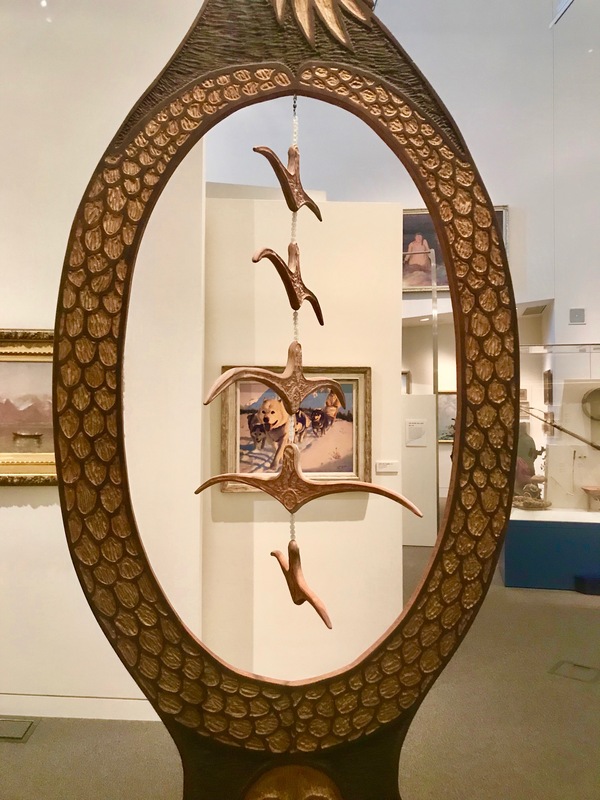 The gallery is divided into the five main geographic regions of the state: Southeast, Southcentral, Interior, Western Arctic Coast and Southwest. 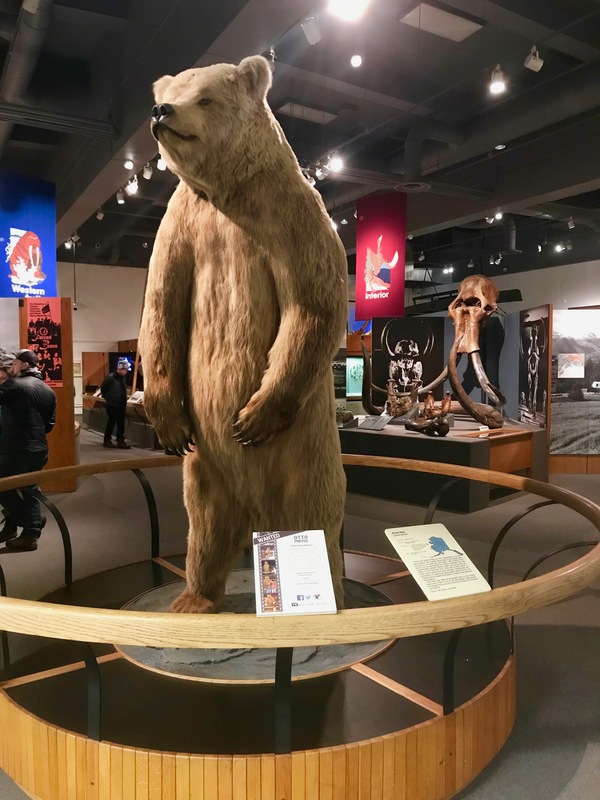 Originally from Herendeen Bay on the Alaska Peninsula, Otto weighed 1250 pounds at the time of his death. Locked in the permafrost, mammoth skulls have often been found by miners, as they worked the frozen ground for gold. 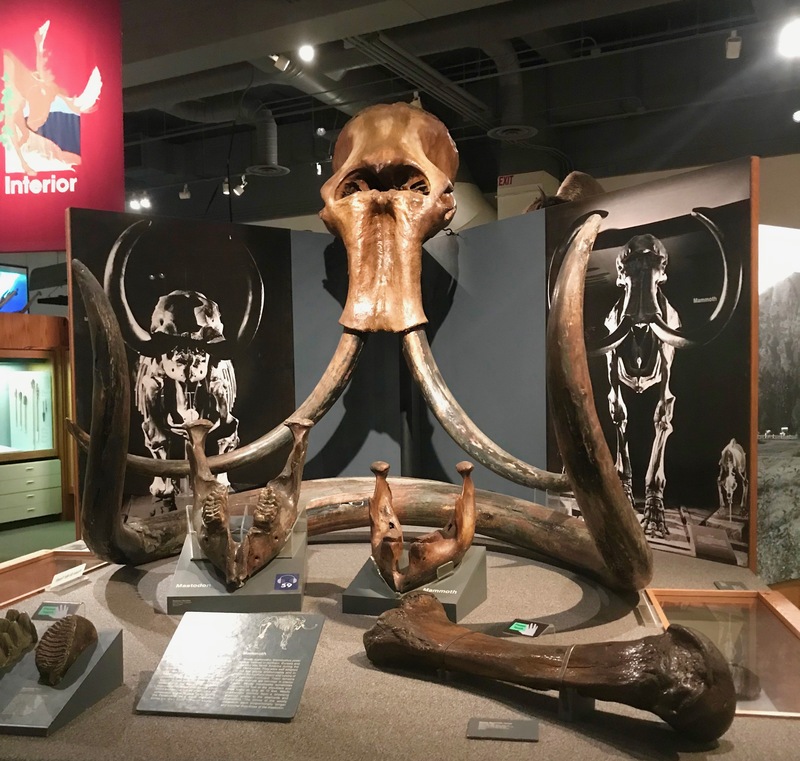 Thirty-one, known, species of Pleistocene mammals roamed Alaska’s ancient grasslands with the mammoth. 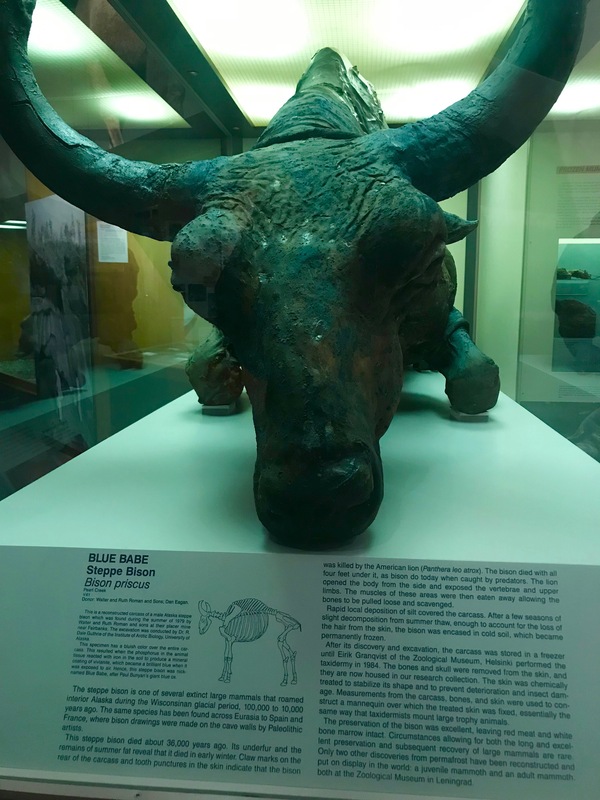 Blue Babe is probably my favorite exhibit at the museum. 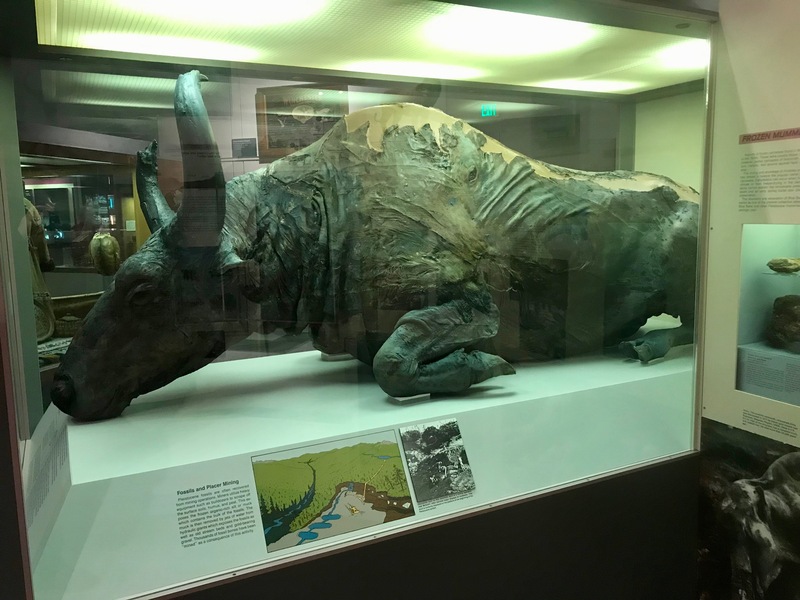 An extinct, mummified, steppe bison, that was discovered in the permafrost by placer miners in 1979. The bison died around 36,000 years ago, killed by an American Lion. The claw and tooth marks can still be seen on the carcass. Shortly after the kill, just before winter, the bison was covered by silt. It was then entombed in cold earth and frozen until excavated. 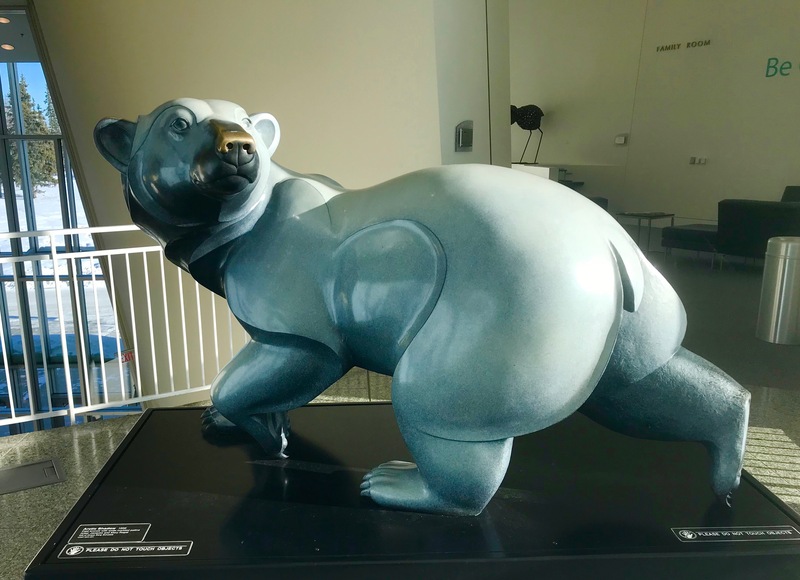 There are only two other discoveries from the permafrost, that have been reconstructed and put on display like Blue Babe. One a juvenile mammoth and the other an adult mammoth, both are at the Zoological Museum in Leningrad. 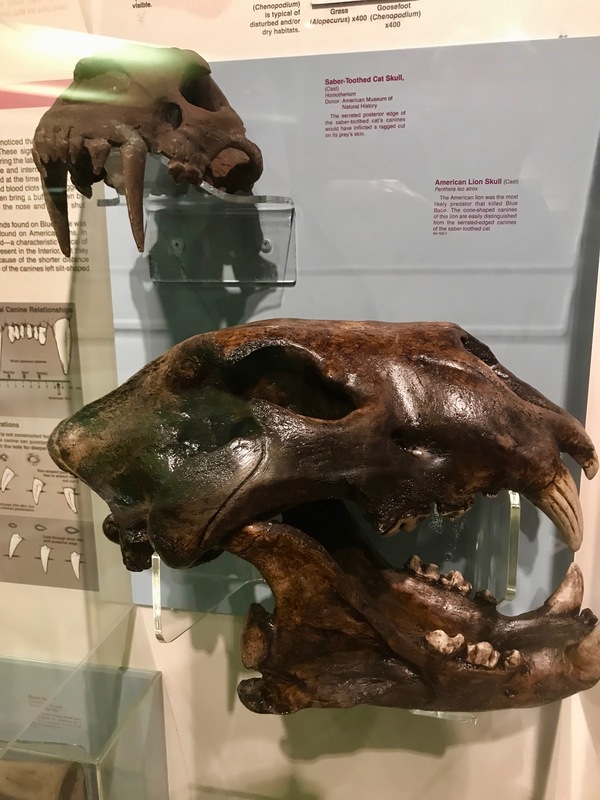 The American Lion, now extinct, was around 25% larger than the modern lion. They roamed North America in the Pleistocene epoch, 340,000 – 11,000 years ago. The museum is open every day in the summer, and slightly shorter hours M-Sat in the winter. Admission is $14 for adults. 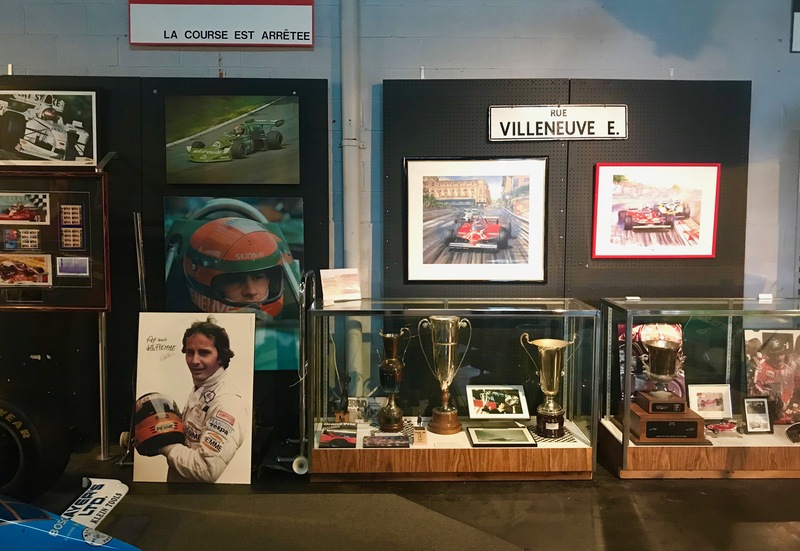 When we were in Quebec, The Curator, The Brazilian and I visited the Gilles-Villeneuve Museum, which is just north of Montreal. The museum opened in 1988 in an old post office building. By 1995, the museum had outgrown the original building, and moved to its current location. The museum receives, on average, 20,000 visitors a year. 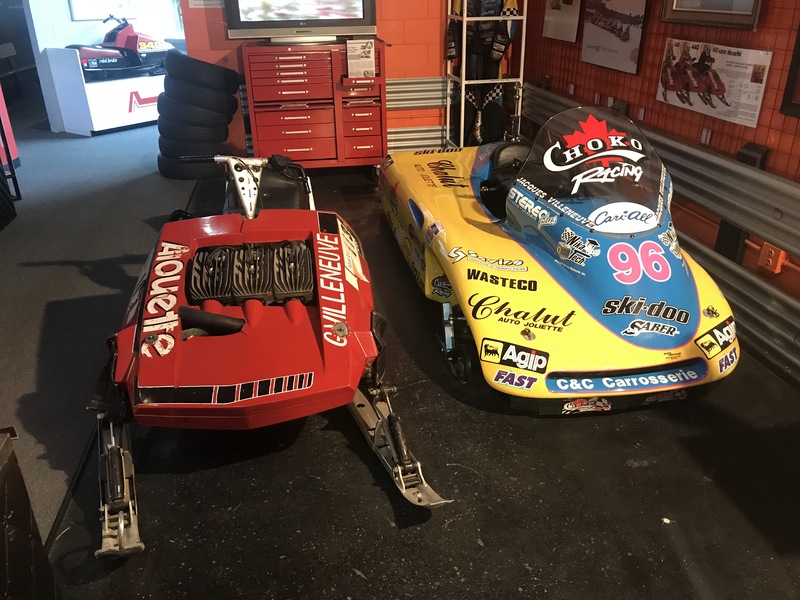 Villeneuve began his racing career on snowmobiles in Quebec. It was his main source of income as a professional driver starting out in his late teens. In 1974, Villeneuve won the World Championship Snowmobile Derby, which only heightened his popularity on the ice. In 1977, McClaren offered Villeneuve a ride in five Formula One races, making his debut at the British Grand Prix. He finished ninth in that race. 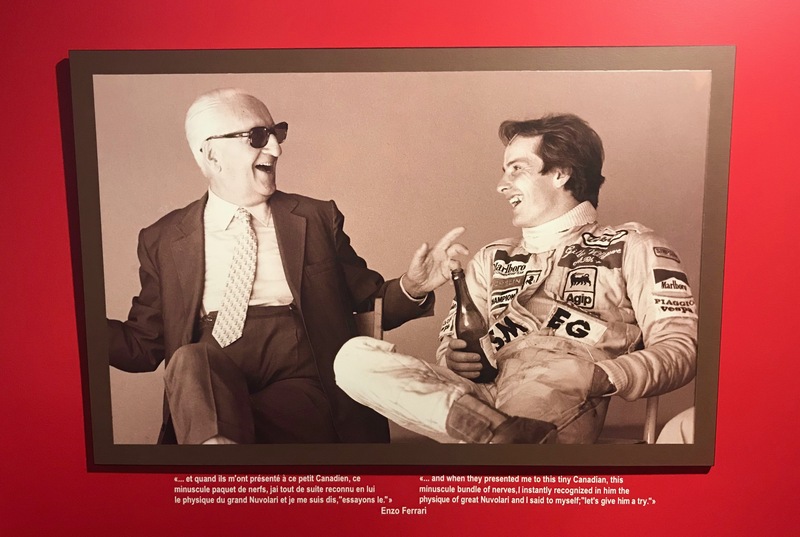 Dropped by McClaren, Villeneuve signed on to race for Ferrari for the final two races of 1977 and the 1978 season, picking up his first win at the 1978 Canadian Grand Prix. In 1979, Villeneuve finished 2nd in the Formula One World Championship. In total, Villeneuve won six Formula One races, with his last win coming at the 1981 Spanish Grand Prix. 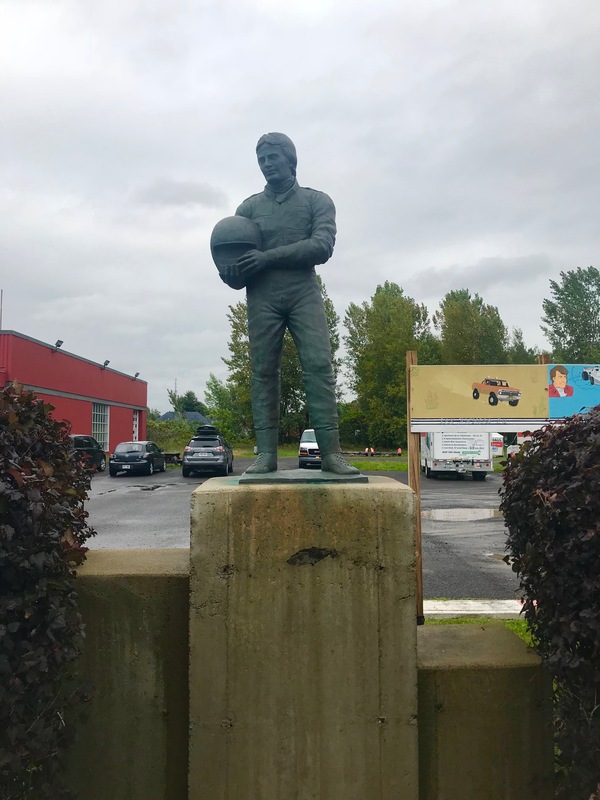 Gilles Villeneuve died on 8 May 1982. During his final qualifying session at the Belgian Grand Prix at Zolder, Villeneuve came over a rise at 140mph, and hit the back of a slower moving car driven by Jochen Maas. Villeneuve’s Ferrari went airborne for over 100 meters before nosediving into the asphalt and disintegrating as it somersaulted. Villeneuve was 32. 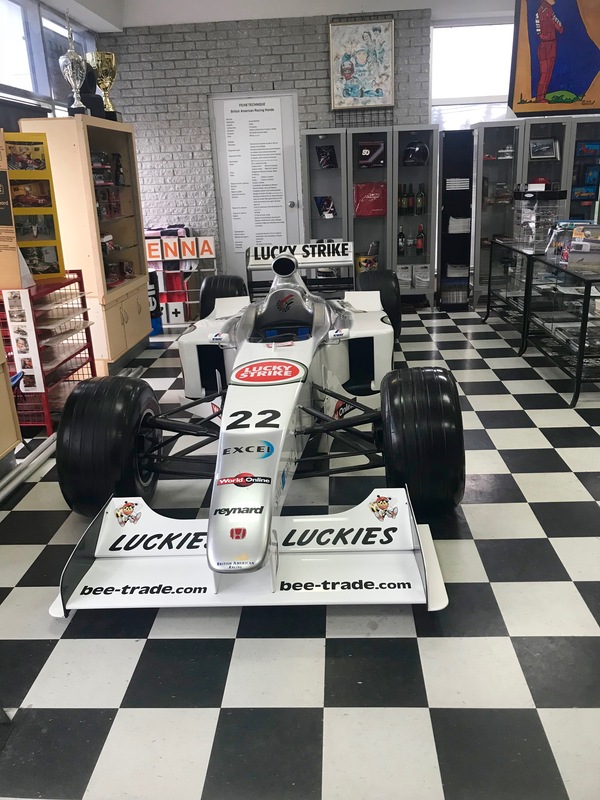 The museum is full of Gilles Villeneuve memorabilia, including his personal Ford 4WD pickup. 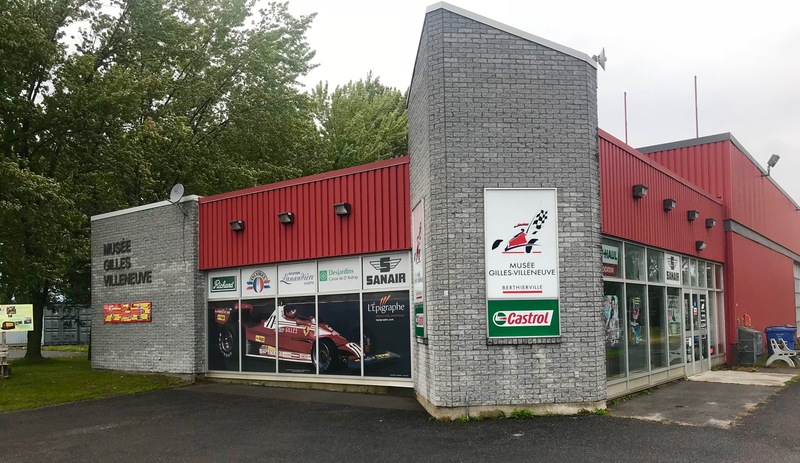 It’s well worth a stop if you’re in the Montreal area. 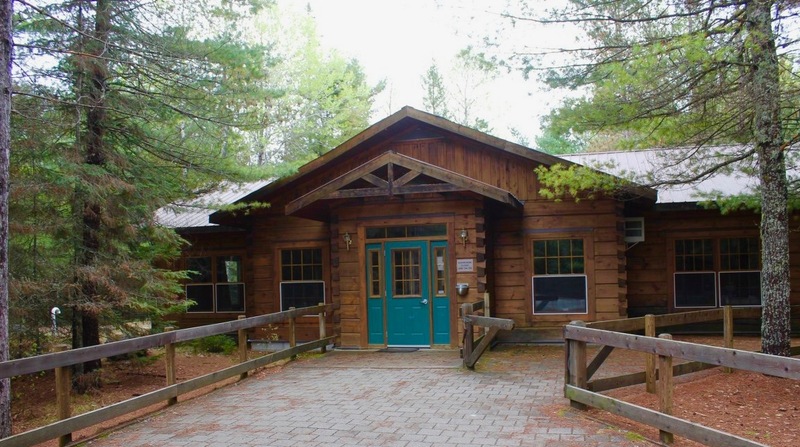 Located in Algonquin Provincial Park is the Algonquin Logging Museum. There is a visitor center with a bookstore and theater, but the exhibits are all outside along a 1.3 km loop trail. It’s a beautiful walk through the forest, but keep in mind the ground is uneven, so if you need the help of a cane, do not be too stubborn to bring it along. During the 1800’s there were periods when over half of Canada’s able-bodied men, worked in winter logging camps. 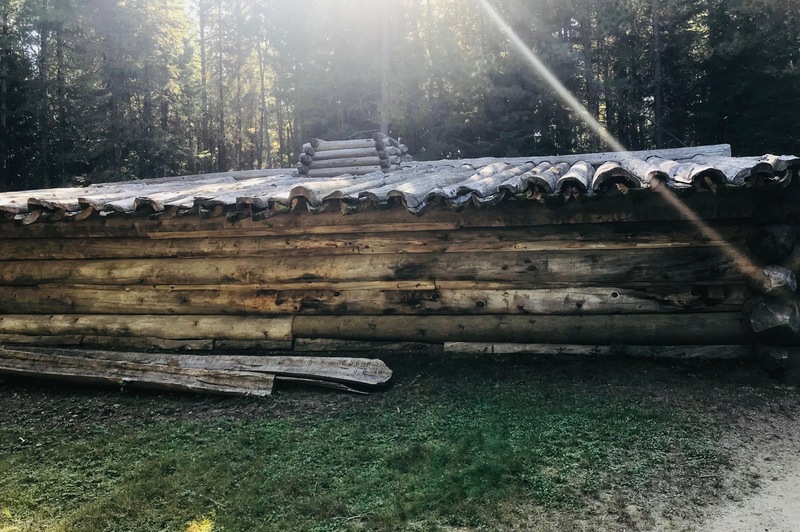 The earliest style of camp was the “camboose shanty”, a log structure with a rough wood floor and central fireplace. A camboose usually housed 52 men, had one entrance, and no windows. I loved the simple design of the camboose roof. 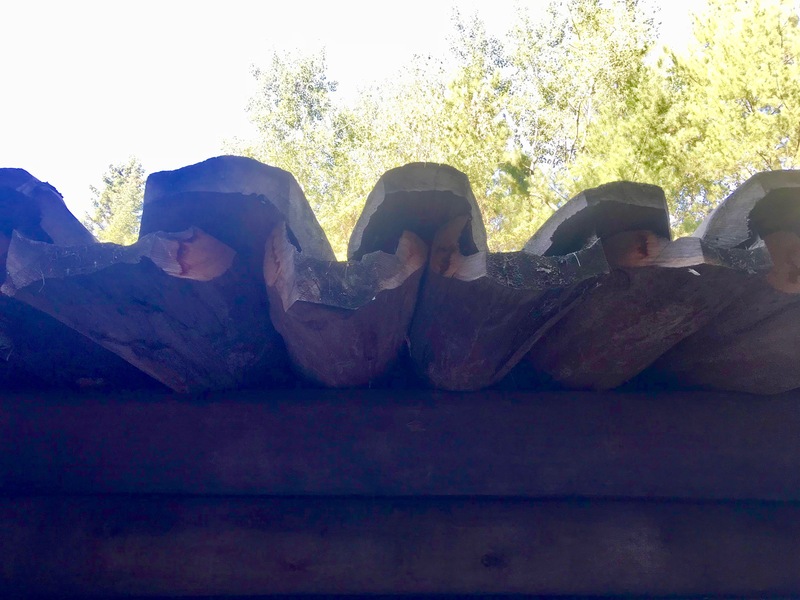 Cedar logs formed into “scoops”, which provided a strong and waterproof roof. The horse stable was much like the housing for the men, just without bunks and fireplace. I took the picture, because I liked the hinges. 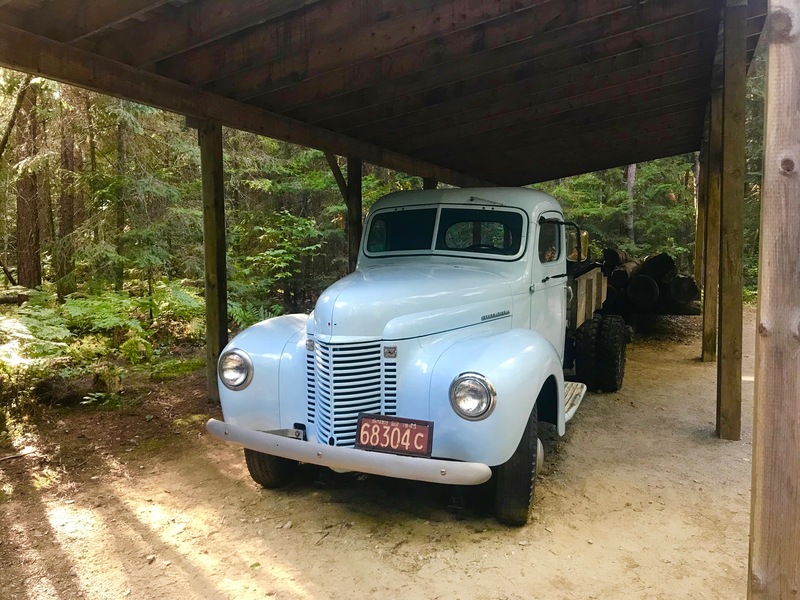 Prior to the arrival of logging trucks in the 1940’s, horse power was the means of log transport. Trees would be skidded to a loading area, then loaded by these lifts onto horse-drawn sleighs. The sleighs would then take the logs down to rivers and streams, and then floated out on the swollen rivers with the spring runoff. Due to the massive weight of a log-loaded sleigh, the haul roads had to be constantly maintained. Loads could be as much as 20 tons. To keep the haul roads as slick as possible, crews would go out at night in their water tankers and spread water on the sleigh-runner tracks, which would freeze immediately. This particular tanker held 100 barrels of water. In 1889, hauling log flotillas across lakes suddenly became a lot easier. 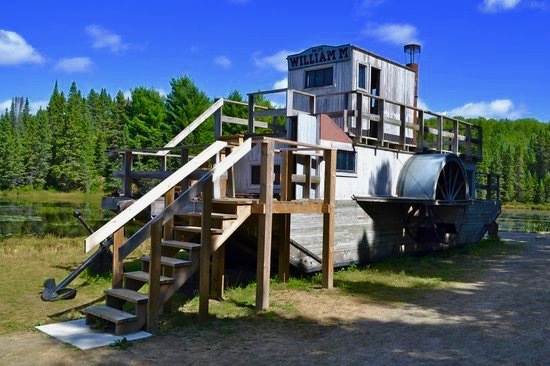 John Ceburn West had invented the “alligator”, a steam powered tug & winch paddlewheeler. The alligator ran on a 20 hp engine, which powered a paddlewheel on either side of the tug. The engine could be disengaged from the paddlewheels, to power the winch and log boom. The winch held 1.6 kms of steel cable. An alligator, powered by 3/4 of a cord of wood, could warp booms of 60,000 logs for ten hours. The alligator could also winch itself overland from lake to lake. The hull had two steel-plated runners, and progress overland was 1-1/2 kms per day. The William M. was built in 1905, and is one of only three alligators that survive today in a reasonably preserved state. 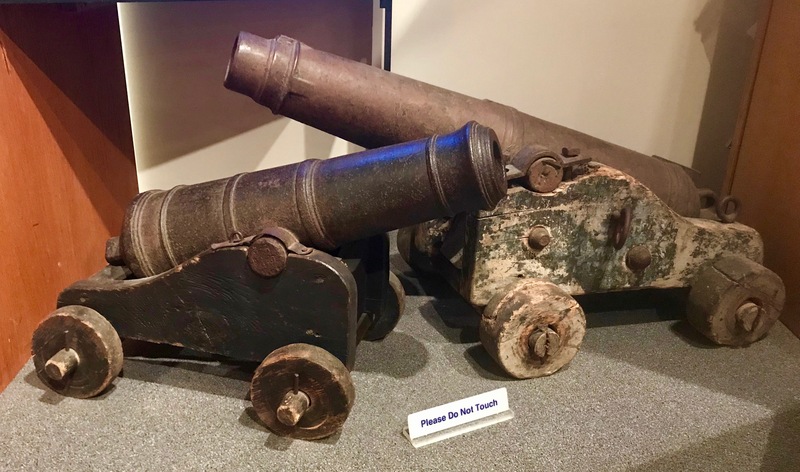 It steamed around the lakes of the Park’s north side until 1946, when it hauled itself out of the water for the last time. 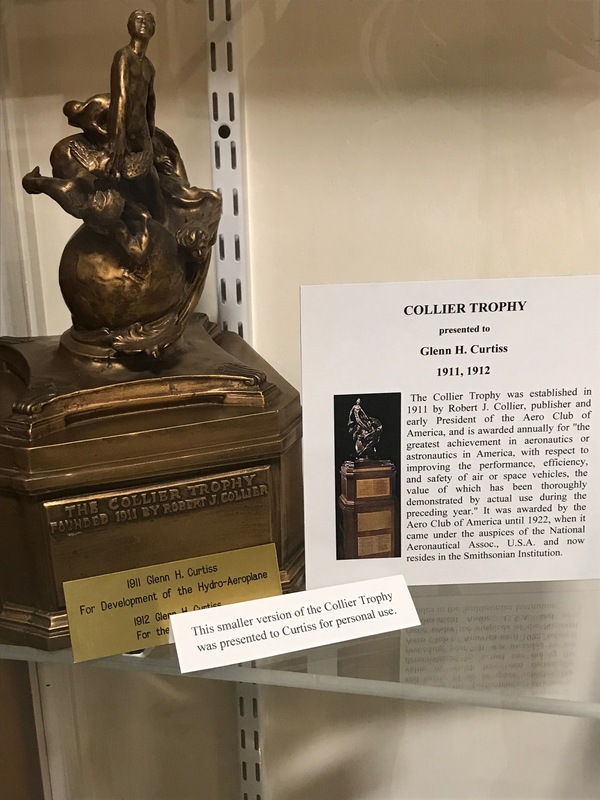 It was put on display in 1960. 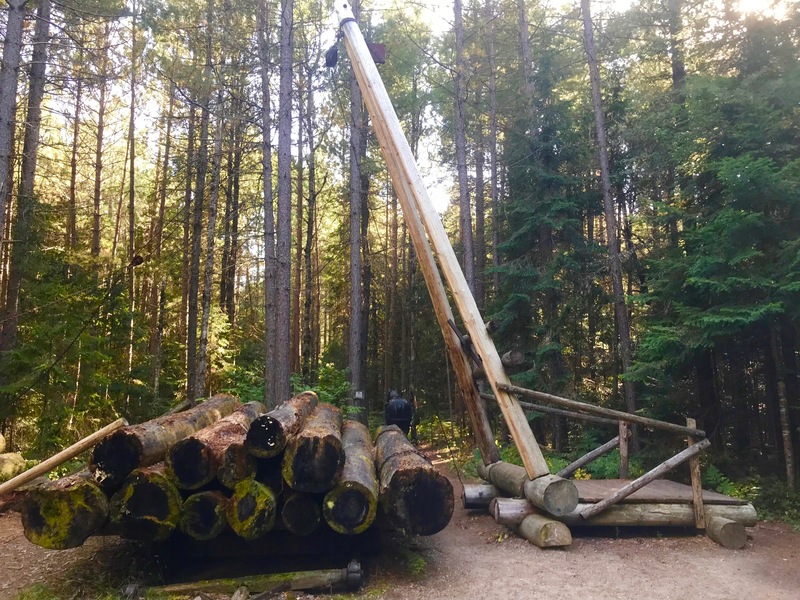 To float logs over obstacles or low water, a combination dam and log chute was built. 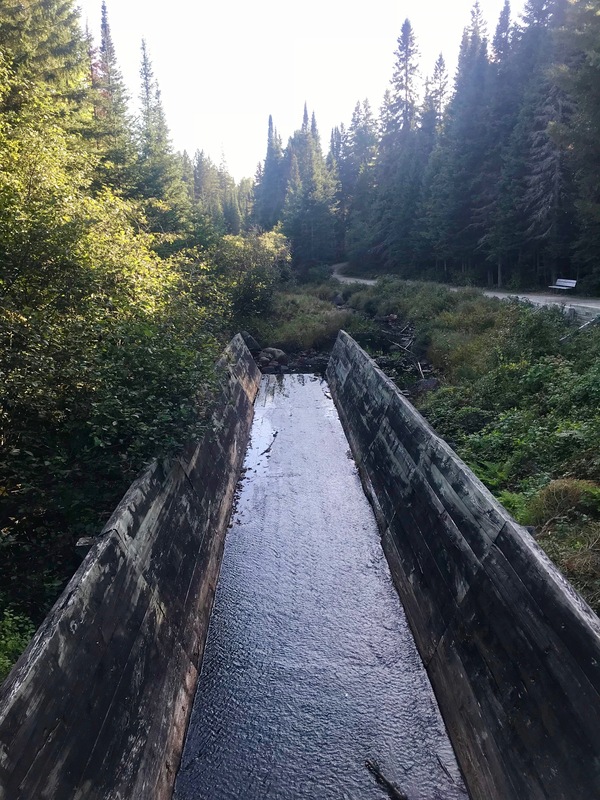 This location saw the log chute in use in the 1920-30’s when logs were floated down the creek here. This chute is only 18 meters (60 feet), which would have been shorter than most of the era. Many were 100 meters long, and one (not in Algonquin) was known to be 16 kms (10 miles) long. The blacksmith shop was from the 1940’s. 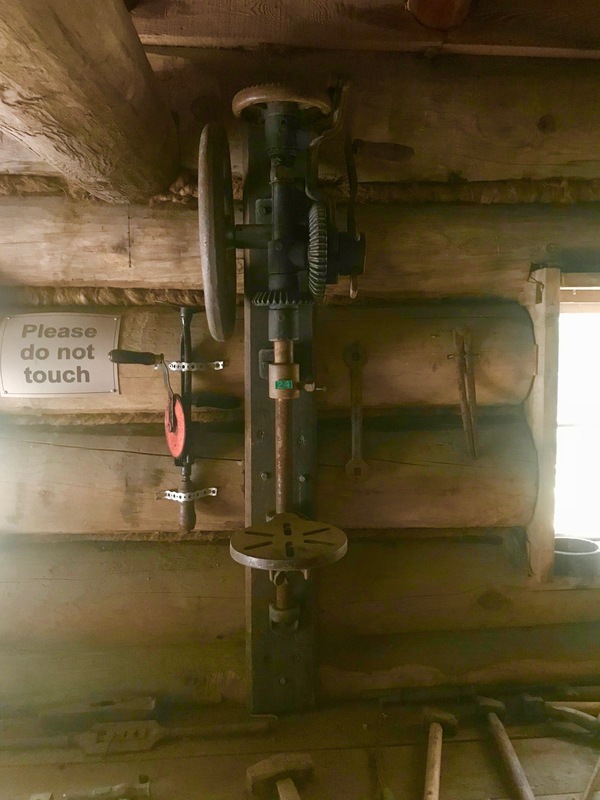 The hand-powered, wall-mounted, drill press is purely for my enjoyment. 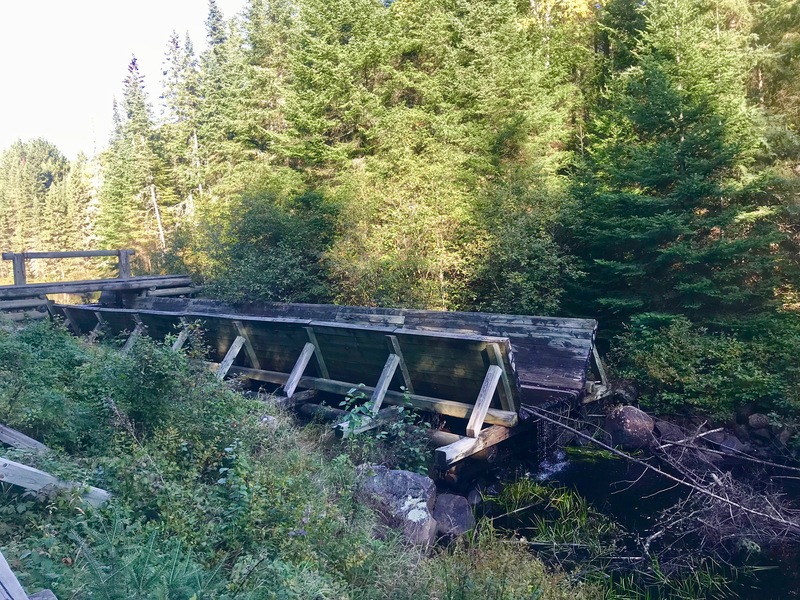 As late as 1959, log drives were made on some Algonquin rivers, but logs had been moving by rail long before that. The Ottawa, Arnprior, and Parry Sound Railway was completed in 1896 by timber barron J.R. Booth. 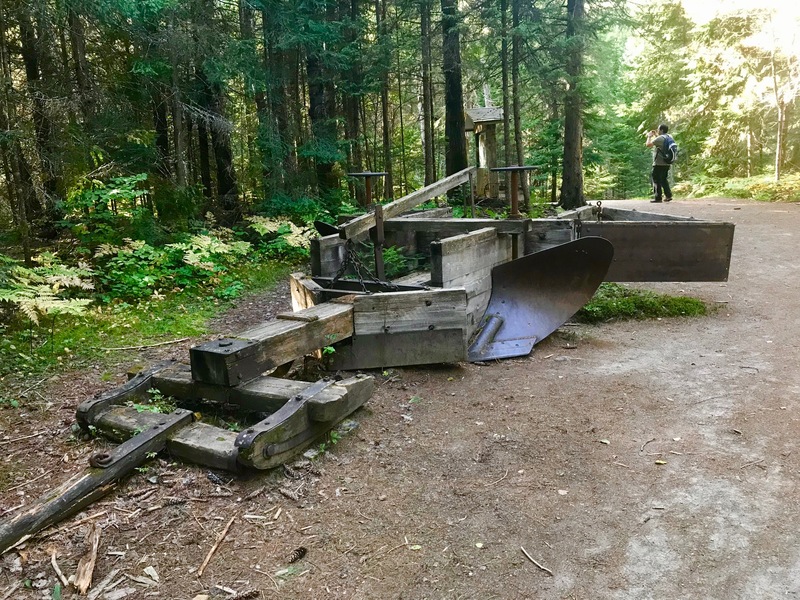 At their peak, six different railroads operated in Algonquin Park. 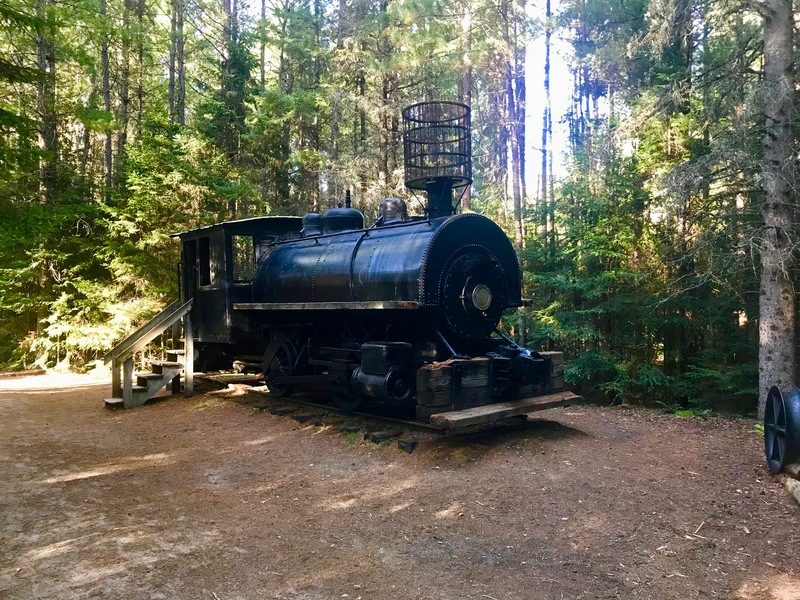 This locomotive was built in 1911 in Montreal. It’s a “saddleback”, due to its water tank mounted over its boiler. 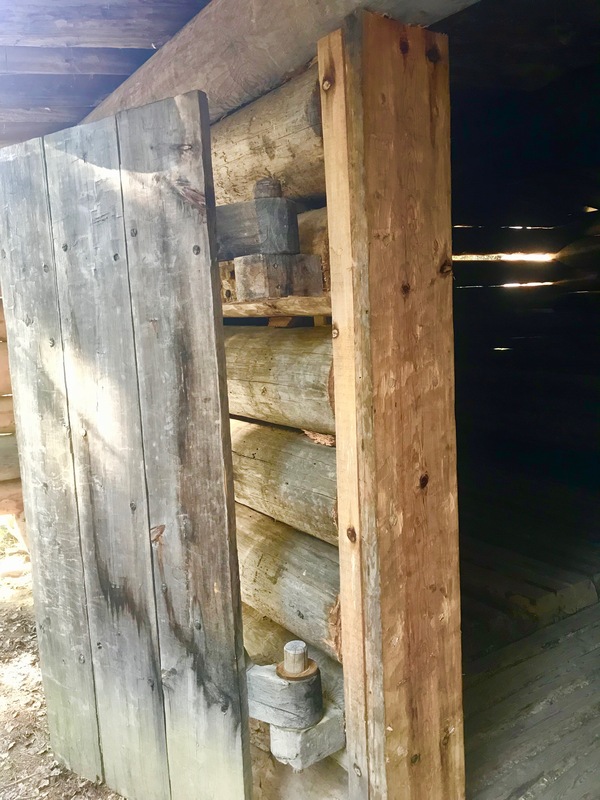 It originally ran on wood, but was later converted to coal. 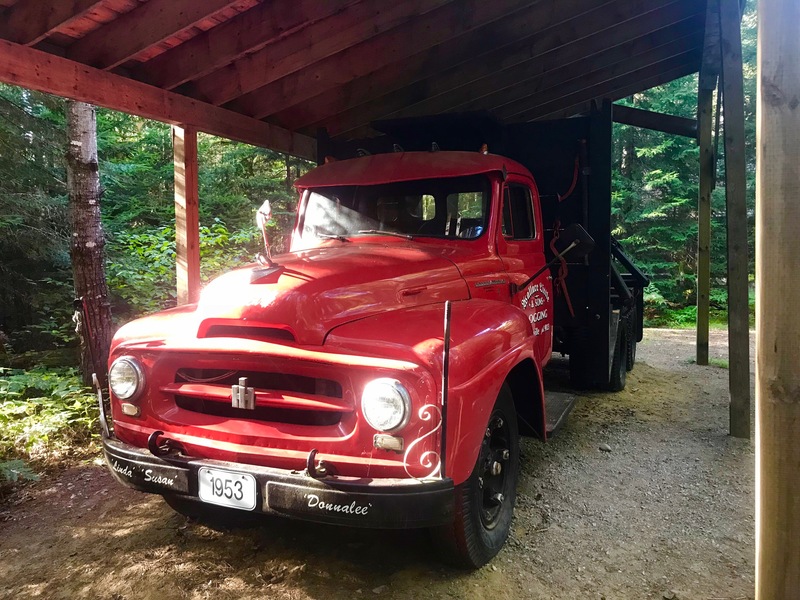 The first trucks came into Algonquin in the 1930’s, and were used initially to pull sleighs. By the 1940’s the trucks had become powerful enough to haul the logs themselves. 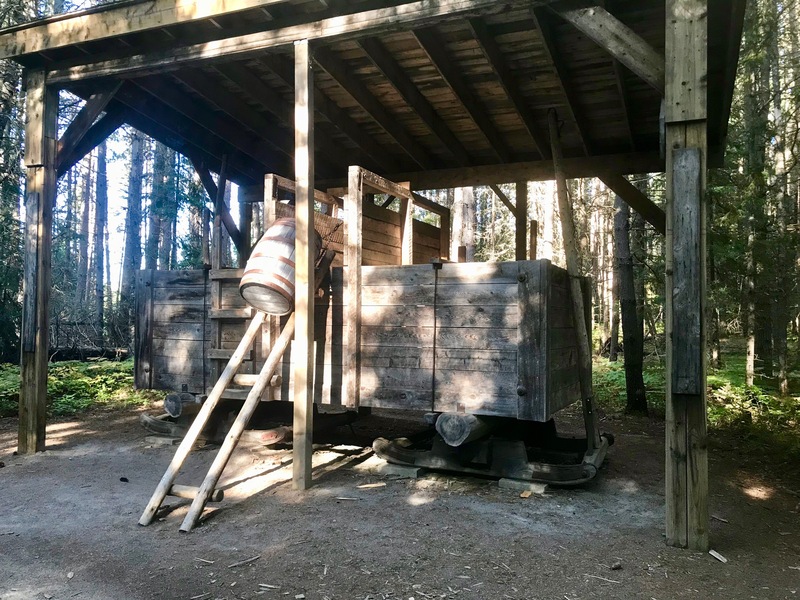 Horses were still used in the bush to skid the logs out, but even that ended by the 1950’s, with the introduction of the first mechanical skidders. Built in 1816 by the future father in law of William Seward, the Seward House is now a museum. William Seward was the governor of New York State, a U.S. senator for New York, and probably best known as the U.S. Secretary of State as a member of Abraham Lincoln’s “team of rivals”. Seward led a fascinating life. He was not a big man in stature, but he was certainly a bold man who dominated the politics of his era. Leave your sword with the bear at the door. Seward lost to Lincoln in the presidential election of 1860, but then became Lincoln’s Secretary of State. We took the tour of the house, led by a volunteer guide. It’s well worth the hour it takes to conclude the tour. The price was $10 with the AAA card. The House holds a lot of Seward family heirlooms. William Seward took the home over from his father in law, and Seward’s son followed him, and his grandson took over the home from there. William H. Seward III donated the house to the foundation. The purchase of Alaska is prominently displayed throughout the tour. One member of our party tried to get the woman at the desk to let me look through the photo album in the glass case. She politely declined. There is a Native Alaskan kayak displayed from the ceiling in the carriage house. 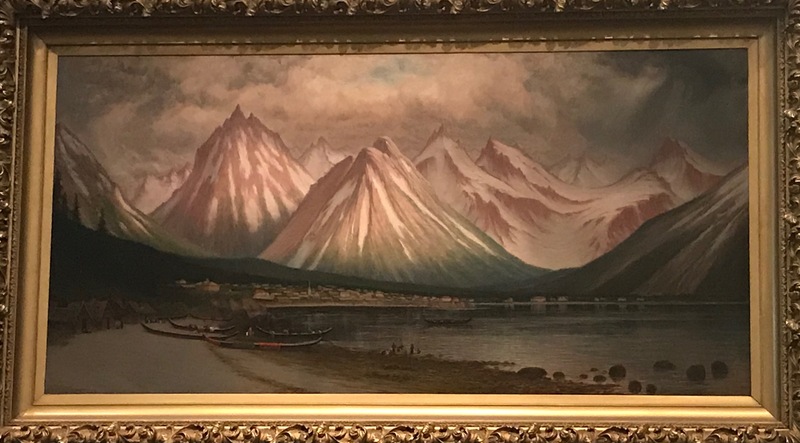 The kayak was given to Seward during his visit to Alaska in 1869. A parlor in the house. Seward passed away while lying on the couch in the picture, although the couch was in another room at the time of his death. Seward’s office, which is the room the former Secretary of State died in. 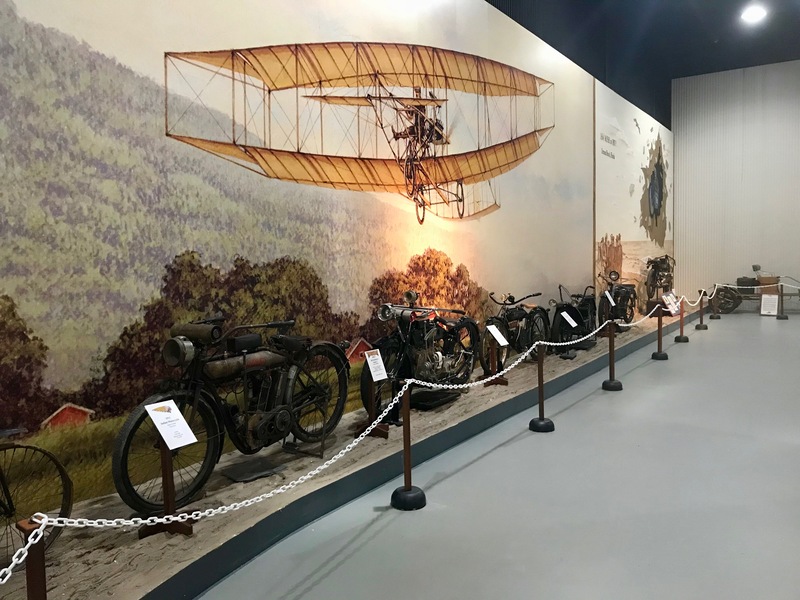 On our way to Geneva, NY we stopped in to the Glenn H. Curtiss Aviation Museum. 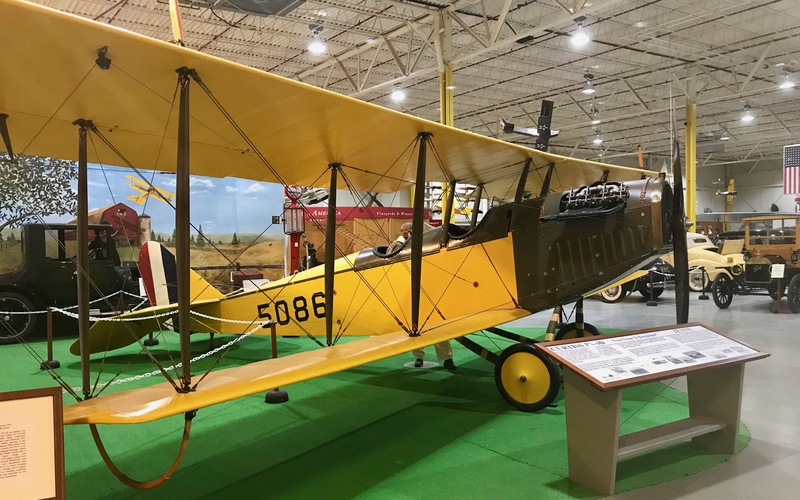 Curtiss was one of aviation’s early pioneers, and this little museum is well worth stopping for. The 1917 Curtiss “Jenny” is a beautiful plane. Often called the “Model T Ford” of the air, the “Jenny” had a major contribution to early aviation. 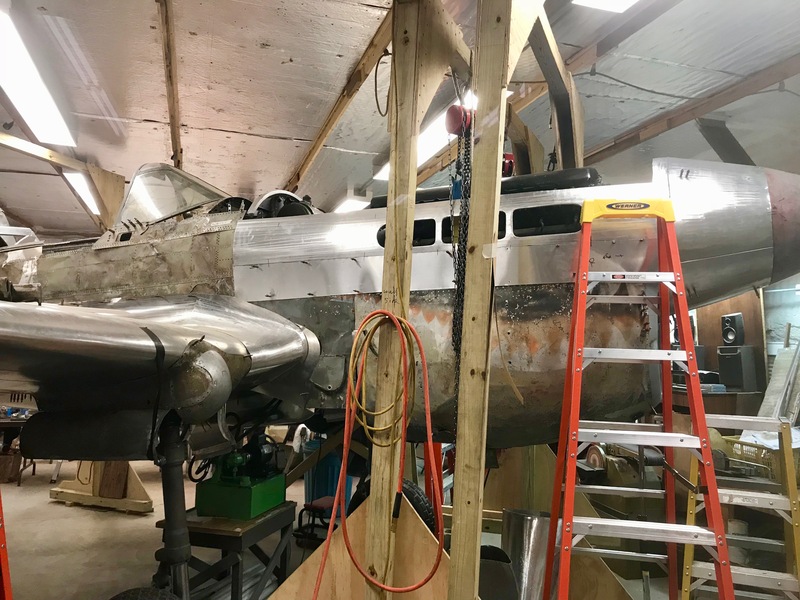 In the back room is a P40 Warhawk undergoing a major restoration. This particular P40, was involved in a mid-air collision in 1945. It crashed into a Florida swamp, and sat there until 1986, when the plane was taken out piece by piece. The museum is the 4th owner of the plane, having purchased it in 2011. Restoration is expected to be completed in 2-3 years. 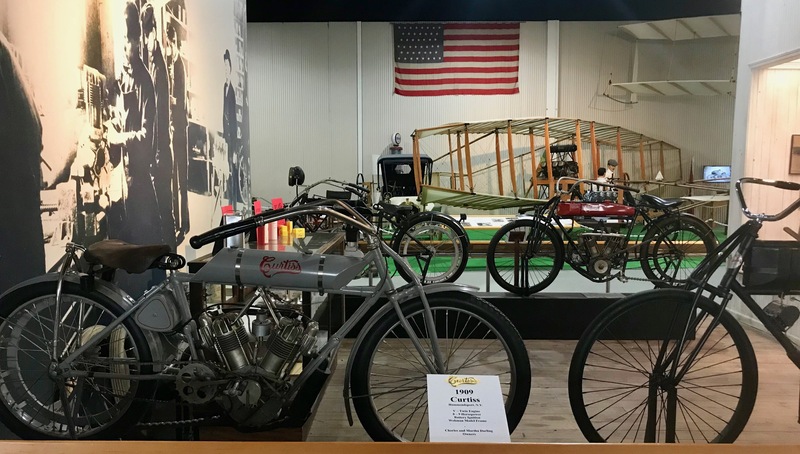 There are several classic, early motorcycles in the museum, including a 1907 Curtiss. The 1907 was powered by a 40HP, air cooled, V8, and was capable 140 mph. 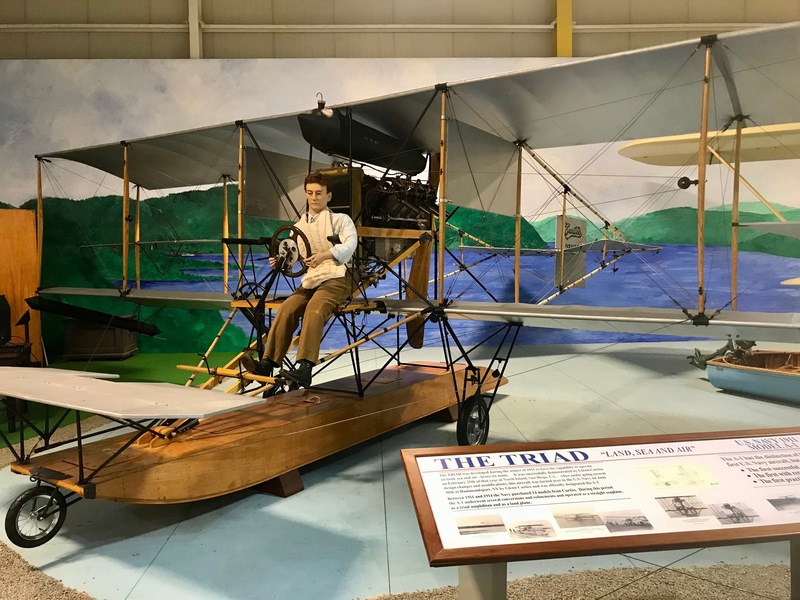 The Curtiss Triad was the first U.S Navy aircraft. It was could take off or land on water or land. The 1914 Curtiss America Flying boat has a 72′ wingspan on the upper wing, and a 46′ lower wing span. It is powered by two Curtiss OXX6 engines, which are hand crank started. 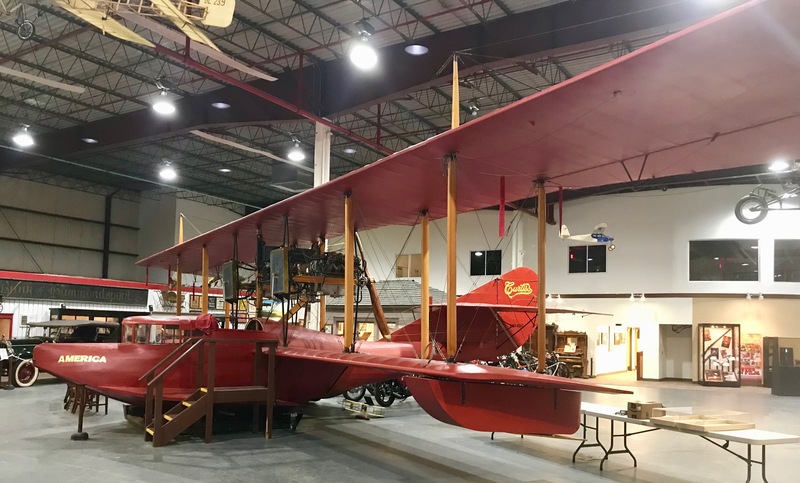 The massive float plane’s restoration in the museum shop was completed in September 2007. The plane was taken out for a test flight later that month. 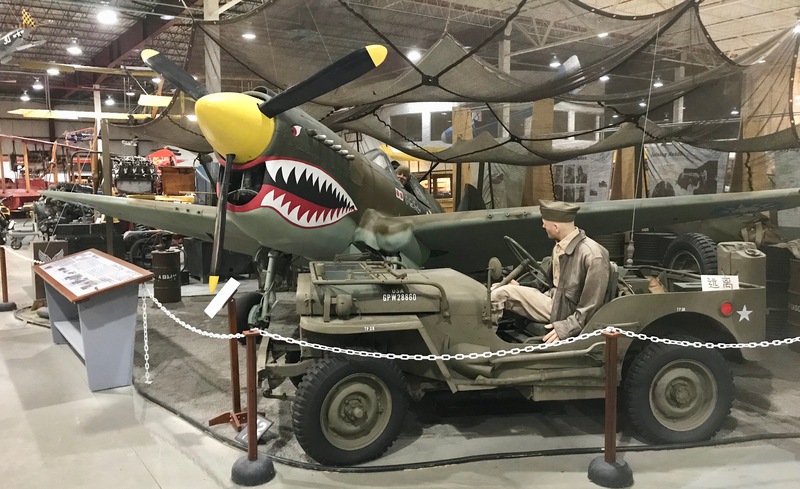 A 3/4 scale P40E Warhawk and a WWII era Ford jeep.